Last summer D and I spent a good bit of time every two weeks heading off to the local pool for a swim (well more of a splash session in a huge bath!) with my sister and niece. I really wanted to get back into the habit of going swimming again now that the warmer weather has come in. However there always seemed to be an excuse for not going, too cold, raining, other things to do, the list goes on and on! So when I got an email from Vosene Kids' to try out their new Afterswim Hair and Body Wash I knew this would be the perfect reason to kick-start our summer swimming trips and I had to say yes! Vosene Kids is a range of products created specifically for kids, they have an extensive range of products too. ( You can see the whole range on their website by clicking on the link) Vosene Kids' recently changed all of their packaging to be simpler, cleaner and much easier for busy parents to recognise on the shelves. The new packaging has bright, clear writing tell you what the product is (Afterswim Hair and Body wash), a basic description of what the product does (Removes chlorine and other impurities) and what the product is generally used for ( Cleans scalp and skin). Vosene Kids have also created some fun and easily recognised characters for each product which clearly describe the main ingredient used in each product. The character for Vosene Kids Afterswim Hair and Body Wash is a little droplet shaped character who is ready to dive into the water with his armbands and swimming goggles on. The character is called Mighty Melon and as you've probably guessed that is the main ingredient and scent! I know that I could feel very confident in dealing with a stroppy 3-year-old while out doing my shopping and still manage to pick the product I am looking for in their range as we walk by. You simply couldn't miss the Afterswim Hair and Body Wash character! Now what you might not know is that going swimming isn't the only place you would be exposed to chlorine. You are exposed to chlorine anytime you pop into the shower or bath and when you drink water. Chlorine as you can imagine isn't great for the skin and it can cause dry, flaky skin. Young children's skin will also absorb more chlorine than adults! This really made me think about how Vosene Kids Afterswim Hair and Body Wash would help D's skin all round and not just after swimming when his skin would be much drier than normal. Vosene Kids use Aromaguard™ technology alongside their own formula in their Afterswim Hair and Body Wash.
Vosene Kids Afterswim Hair and Body Wash is part of the Gentle to Skin range. There's so few ingredients (15 to be exact) used in the range and what is even better is that all those with sensitive skin can use this range without worrying about any nasty additives. The Vosene Kids Gentle to Skin range is free from paraben, soap, SLS (Sodium Lauryl Sulfate), SLES (Sodium Laureth Sulfate) and MIT (Methylisothiazolinone, which can be toxic!). It is also friendly to all children over the age of 3 months which means the whole family can use these products. What's more, the Vosene Kids Afterswim Hair and Body Wash is hypoallergenic and has been dermatologically tested. It is even tear free and has been approved by pediatricians! When we got the Vosene Kids Afterswim Hair and Body Wash I decided to just set a day and stick to it. We went on Friday last week and it was raining! I was quite surprised that we had been saying we couldn't go in the rain as we would be cold and wet which is never a good combination. That wasn't the case and we actually found that the pool wasn't very busy on a wet day. D was so excited about getting in the pool and wanted to take the Vosene Kids' Afterswim Hair and Body Wash into the pool with him! We did get in the pool and stayed for a good hour and a half/ two hours. The moment we got out of the pool D was asking if we could use the Afterswin Hair and Body Wash. He was so very excited I even managed to get him into the shower cubical! A rarity that usually ends in disaster as he hates showers and we usually have to wait until we get home to get in the bath. Once we where in the shower he stood under the water for about a minute before he decided it was not for him. He did seem to perk up again when we actually lifted the Afterswim Hair and Body Wash. I added a small amount to D's hand and let him wash his body while I washed his hair. Being able to use one product to wash his whole body meant that he was squeaky clean in under 3 minutes! I was surprised by how well the Afterswim Hair and Body Wash worked. I couldn't smell any chlorine on D and his skin had been re-hydrated in the process. He wasn't wrinkly like he had been when we got in the shower. I hadn't been expecting that to happen. I found that it also foamed up well and had a great coverage when using a small amount of the liquid. I also used the Afterswim Hair and Body Wash, in fact I had completely forgot to bring my conditioner with us. Usually when I don't have conditioner my hair will go crazy and be almost impossible to brush as it is so thick. That didn't happen and my hair felt and looked conditioned once it had dried. We both smelled lovely and you could distinctly smell melons, usually the smell wears off when we rinse products off. We ended up going swimming again on Wednesday with the intent of trying out the Vosene Kids Hair and Body Wash in a different way. We got out of the pool and rinsed off using the shower instead of actually getting washed. D refused to get back in the shower after having a rinse anyway! We did come straight home and run a bath which D was much more happy to get in. I wanted to see the difference it made to D's skin. On the way home his skin felt dry and it actually felt a bit rough on his arms. He has got sensitive skin and the chlorine was adding to that sensitivity. You could also distinctly smell the chlorine on him. After he had got in the bath and got a good wash using the Afterswim Hair and Body wash it all disappeared, completely. His skin felt and looked much healthier and there was no trace of any chlorine smell, just nice fresh melon! We have since used it in the bath without going swimming and I must say that there is still a difference in D's skin compared to him getting a bath using our usual products. While D was getting out of the bath he accidentally stood on the bottle which had got knocked off the side and the top never opened! It didn't even budge. The lid was still very easy to open and could be done with one hand. Overall I would have to say the Vosene Kids Afterswin Hair and Body Wash works perfectly and does everything it claims to. This is something that I know we are going to use every time we go swimming now and we will even be taking it with us when we go visit my mum for using after we visit the beach to remove all those impurities and the salt from D's skin. I honestly can't find one bad point to say about Vosene Kids Afterswim Hair and Body Wash and in fact I am hoping that Vosene Kids will being out a bubble bath or similar product that removes the chlorine in bath water! I would recommend Vosene Kids Afterswim Hair and Body Wash for anyone with children who go swimming in any indoor pools where chlorine is present, who visit the beach and I would say this is a product that is perfect for taking on holiday. 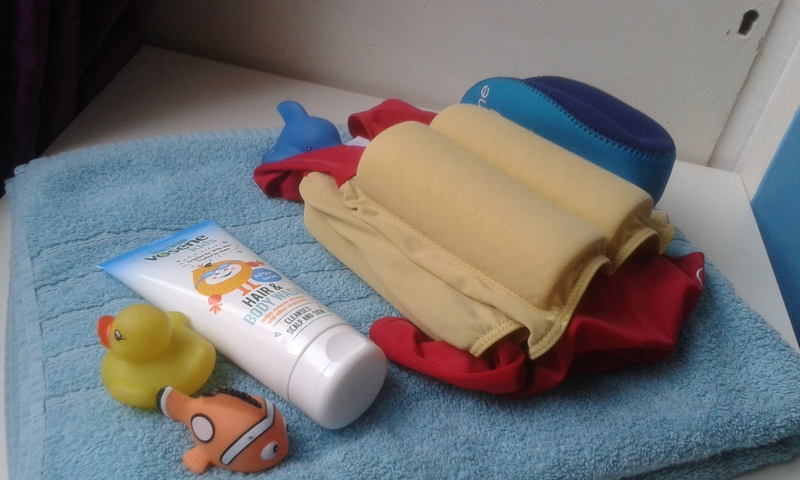 You wouldn't need to bring any other product with you for washing your children and for me knowing that D's skin would not be effected by the changes in water wherever we go is a big plus. 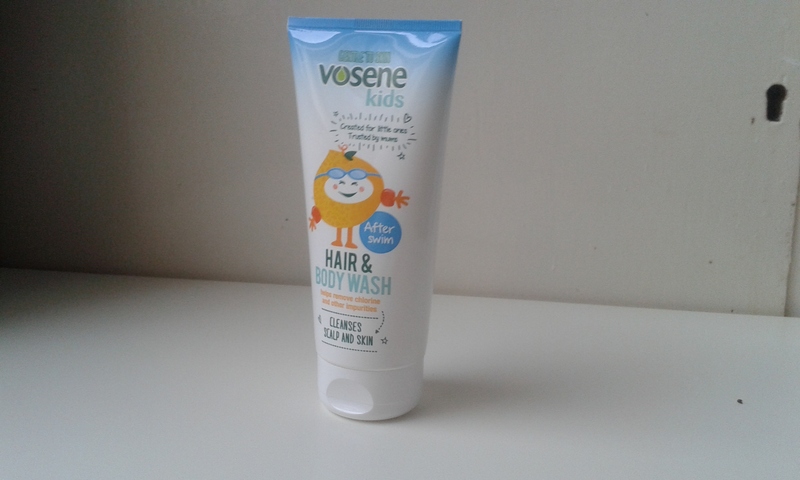 Vosene Kids Afterswim Hair and Body Wash can be purchased in some Sainsbury's and Asda stores. You can also purchase it on Amazon by clicking on the link above. Vosene Kids Afterswim Hair and Body Wash has an RRP of £2.49 per 200ml. Disclaimer: I was sent Vosene Kids Afterswim Hair and Body Wash in return for an open and honest review. All thoughts and opinions above are my own.